November/December Ska Shows and News | Jacob Wake Up! So I missed the first couple weeks of November but there’s still a decent amount going on. I wasn’t able to make it to The Toasters on November 3rd at Johnny D’s. Did anyone catch any video from the show? I wasn’t able to find any on YouTube. It’s okay, The Toasters will be at TT’s in March. 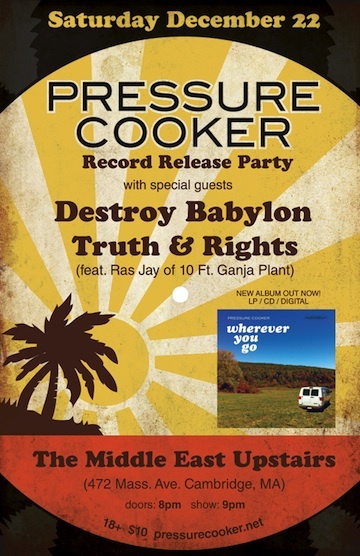 Pressure Cooker was spoke to Roots Rock Rebel Radio (CKUT) last Wednesday about their new record. Hear the interview and tracks from the record (Musical Occupation has the playlist). Their new album “Wherever You Got” is available on iTunes, CD Baby, Spotify, and on Vinyl. They have three songs you can download in full on their website. Lots going on in the Bosstones world: Hometown Throwdown openers are Bouncing Souls and Amazing Royal Crowns. Great bands but I’d love to see some young/new talent on the bill. I’ve got tickets to night one and I believe tickets are still available for all three (h/t Dying Scene). In other news, Joe Gittleman talks to Creative Loafing Atlanta and shares some memorable moments from the band’s history. Oh and Dicky Barrett apparently has some super-vague big news to share on Radio BDC on Monday at 10am. The Allstonians are putting the finishing touches on new music and expect to have a Christmas song in there, too. Also, that show at Great Scott isn’t happening and I have no idea if the show at TT’s actually happened. In domain drama, someone is now squatting on theirs. Kickstarter to help them get their domain back? Meanwhile, I’ve since bought bostonska.net (if the cross-posting didn’t already imply that). There’s not much there yet but I’d essentially like help promote bands, shows, and generally hype up the scene. Email me at jake (at) bostonska (dot) net if you’d like to contribute in any way. Also, I’m still on the hunt for band mates.